Christmas has come early for me! There was a knock on the door yesterday and it was the delivery of an unexpected parcel. 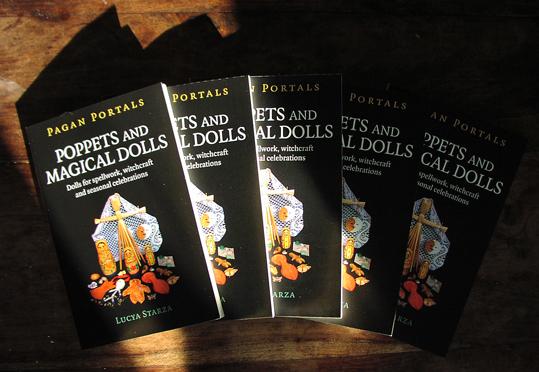 Inside I found the very first printed copies of my latest book, Pagan Portals - Poppets and Magical Dolls. Although the book isn't due to be published until summer 2018, you can pre-order copies already. Poppets are dolls used for sympathetic magic, and are designed in the likeness of individuals in order to represent them in spells to help, heal or harm. The word poppet comes from the Middle Ages in England, originally meaning a small doll or child, and it is still in use today as a name of endearment. The term is older than the phrase ‘Voodoo doll’. Pagan Portals – Poppets and Magical Dolls explores the history of poppets and offers a practical guide to making and using them in modern witchcraft. It also covers seasonal dolls, from Brigid dolls, used in celebrations for the first stirrings of spring, to fairy dolls enjoyed in tree-dressing at Yuletide. Other topics covered include spirit dolls, ancestor dolls and dolls as representations of mythological beings and creatures from folklore. The book is in a similar style to my earlier book, Pagan Portals - Candle Magic. Both are designed as introductions to traditional aspects of practical magic and teach a range of techniques for effective spellwork. You can pre-order Pagan Portals - Poppets and Magical Dolls on Amazon and order Pagan Portals - Candle Magic on Amazon.